The best way to appreciate manatees is from a respectful distance. For their own protection, wild animals need to stay wild to survive. Look, but don’t touch. Avoid excess noise and splashing. 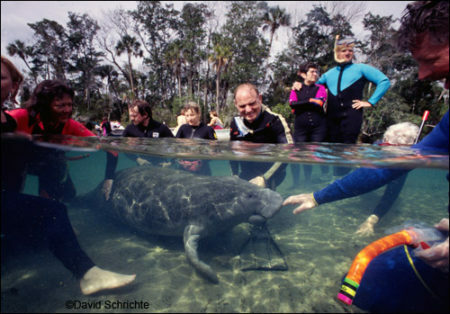 Practice “passive observation” and observe manatees from above water and at a distance. Resist the urge to feed manatees or give them water. Stash your trash. Discard monofilament line, hooks, and other trash properly. Do not enter designated manatee sanctuaries for any reason. Call 1-888-404-3922, #FWC, or *FWC, email or text Tip@myfwc.com, or use VHF Channel 16 on your marine radio if you see an injured, dead, tagged, or orphaned manatee, or if you see a manatee being harassed. By quietly observing manatees, you will get a rare opportunity to see the natural behavior of these unique animals. I don’t understand how interacting with manatees can be harmful to them. They’re so big! I could never hurt them and besides, if they don’t like it, they could just swim away. 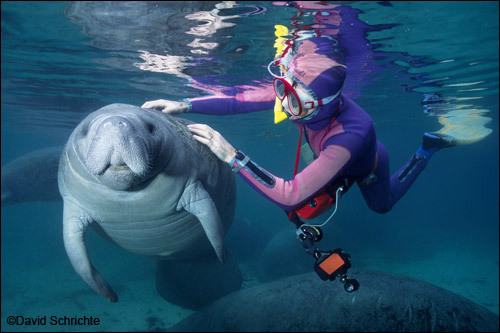 Disturbance from human activity can cause manatees to leave a warm water area, putting them in harm’s way from cold exposure or nearby vessel traffic. Disturbance can also cause manatees to expend precious energy milling around to avoid contact or interaction within a warm water area. I think the best way for people to appreciate manatees is to see them up close and personal. It’s a way to get people interested in helping them. Save the Manatee Club believes the best way to appreciate manatees is from a respectful distance. Natural manatee behavior can be disrupted by humans who approach manatees too closely. People should never approach, chase, surround, touch, disturb, ride, or poke manatees; give them food or water; or engage in any action that could separate a mother and calf. By observing manatees at a distance we have the best chance to observe natural behaviors, giving us a glimpse into the lives of these interesting creatures. We believe that is the best way for people to learn about manatees. Example of manatee harassment: surrounding. Why is it so bad if a mother and calf get separated? 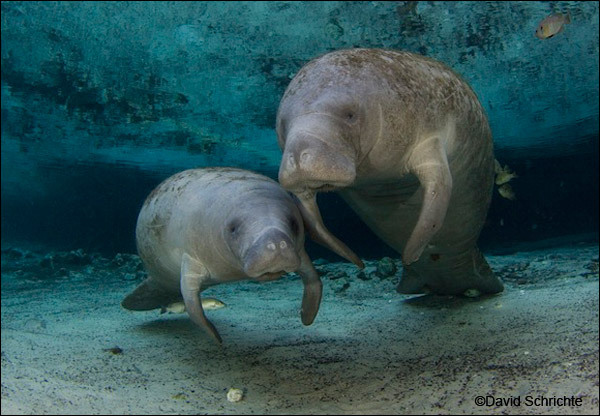 Manatee calves are dependent on their mothers for up to two years. Not only do mothers feed their calves, but they also teach them essential survival skills. Calves who are separated from their mothers may not be reunited. For example, if a mother swims away while a calf is being petted, the calf may not find its way back to her and could ultimately die without her. I’ve been in the water before with manatees and some of them come right up to me and roll over to have their bellies scratched. It seems to me like they enjoy it. Manatees who exhibit this behavior may have been “tamed” from previous interactions with other humans. As appealing as it may seem to interact with manatees, we have to always keep in mind what is best for them. For their own protection, wild animals need to stay wild to survive. What is wrong with feeding manatees or giving them water? Feeding manatees or giving them water can result in behavior modification and changes to their natural feeding patterns. Manatees may expect food or water, be harassed, or fed items that are not a natural part of their diet. They may also lose their fear of humans. “Tamed” manatees may approach a boat expecting food or water, only to be injured or killed by a propeller or become entangled in fishing gear. Manatees also sometimes like to feed on the vegetation that gets wrapped around the boat’s propeller. Before starting the engine, always check around your boat for manatees. 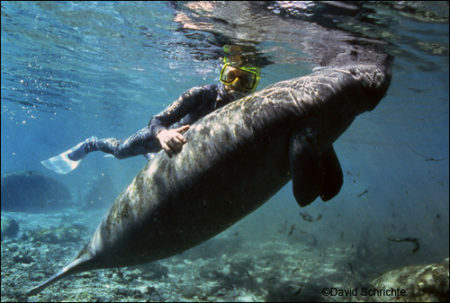 Example of manatee harssment: riding. I always put out a hose for manatees at the marina because they look thirsty. Since they are in salt water, I assume they need it. Manatees can be found in fresh, brackish, or salt water and do not need to drink fresh water every day. Manatees are skilled at finding sources of fresh water as they travel. Encouraging manatees to approach boats or docks to drink from a hose changes their wild behavior and could put them in harm’s way. I’ve heard there may not be enough natural seagrass for manatee. I need to feed them to help them survive. While seagrass beds may be declining in some regions of the state, there is enough vegetation to sustain a healthy manatee population. In addition to seagrass, manatees also eat other submerged, floating, and emergent plants. Nevertheless, it is important to continue to protect seagrass from pollution and propeller scarring and support other seagrass recovery efforts. I don’t understand how throwing a few things in the water can harm a great, big animal like a manatee. Debris in waterways, such as discarded plastic bags, six-pack holders, fishing hooks, or monofilament line is dangerous to manatees and other forms of wildlife. Litter, especially plastic litter that does not degrade, can get tangled in plants that manatees eat, and manatees can become entangled in or accidentally ingest these plastics or other foreign objects. When manatees swallow a plastic bag or fishing line, it can choke them or cause an intestinal blockage, both of which can be fatal. Fish hooks can puncture their esophagus, stomach, or intestinal lining and lead to infection that can result in illness or death.